Alkalinity is a measure of a ponds ability to neutralize acids and resist changes in pH – also known as “buffering capacity”. Water quality is an extremely important aspect of freshwater husbandry, with numerous parameters, measurements, and “ideal” standards we continuously strive to achieve so our koi are able to flourish in their environment. Most fish keepers will likely have a good understanding of certain topics of water quality, such as the importance of beneficial bacteria in regards to ammonia and nitrate control. However, there are other elements of that also contribute to water quality and fish health that can be considered just as important, but sadly tend to fall to the wayside due to confusing definitions and misinformation. Those water quality parameters are that of alkalinity (KH) and general hardness (GH) – both very important aspects of optimal koi keeping. These two parameters are often interrelated, but are still individually distinct measurements that can have heavy influence on other aspects of water quality, such as pH, ammonia toxicity, and the nitrogen cycle. Alkalinity, or KH ( carbonate hardness), is a measure of waters ability to resist changes in pH with the addition of acids, also known as it’s buffering capacity. Water hardness, or general hardness (GH), is a measure of the total dissolved mineral content in water, often in the form of calcium (CA++) and magnesium (Mg++) ions. General hardness, when caused by calcium, is important for replenishing alkalinity levels, locking down dissolved toxins, and will aid koi in several bodily processes, such as the regulation of salt within the blood. Both alkalinity and general hardness levels usually come from limestone or dolomite, in the form of calcium carbonates and magnesium carbonates. As it rains, water (H2O) reacts with atmospheric carbon dioxide (CO2) to form carbonic acid (H2CO3), which then works to react with mineral-rich rock to form various metal carbonates. The resulting water is both considered harder due to the dissolved calcium and magnesium, but also higher in alkalinity due to the carbonate component, which works to neutralize acids and maintain stable pH levels. Pond Alkalinity & KH (Carbonate Hardness) – What’s the Difference? Hard water and alkalinity are closed linked, with many ponds alkalinity coming from naturally occurring limestone. The total amount of base present in pond water defines the water quality parameter of alkalinity. It is essentially a measure of the waters ability to neutralize acid and buffer pH, also known as its “buffering capacity”, and is formed primarily of carbonate compounds in many hard water regions. The definition for alkalinity can sometimes vary, but in regards to pond aquaculture, it’s usually a measure of the total amount of bases present that have an influence on the pH buffering capacity of water. Outside the pond hobby, such as in saltwater aquaria, it may also refer to the total amount of alkaline compounds within a solution, including alkali metals that do not contribute to the pH buffer (i.e., sodium hydroxide). For all intents and purposes related to fresh water ponds, alkalinity can be described as the pH buffering capacity of water, compromised of mostly calcium carbonate (from limestone) and magnesium carbonate (from dolomite). It is expressed in mg/L or ppm (parts per millions) calcium carbonate [CaCO3]. KH, also known as “carbonate hardness“, is a term used commonly in the pond (koi) hobby to refer to the total amount of carbonates and bicarbonates within a solution. Although occasionally defined differently to alkalinity, almost all pond testing kits will present KH and alkalinity in the same way, being a measurement of the waters ability to buffer pH and neutralize acid. KH is sometimes refereed to as carbonate hardness, which makes reference to the “carbonate” component of calcium and magnesium carbonate, as these are the primary pH buffering components in many hard water areas. When testing in fresh water applications, KH and alkalinity can be thought of as the same parameter, although sometimes KH will be presented in degrees (dKH) rather mg/L or ppm. One “dKH” equates to 17.9 mg/L (ppm), which you can use for conversion purposes if necessary. Note: Carbonate hardness actually has nothing to do with water hardness, so the name can be confusing. It should not be confused with general hardness, which actually does have everything to do with hardness! More info here:- General Hardness Guide. Why is Alkalinity so Important? How does it Effect pH & Fish? Plants, algae, and phytoplankton will cause pH to rise and fall throughout the day, with the rate of change determined by total alkalinity. Alkalinity (KH) is a requirement for keeping stable pH parameters, and avoiding sudden pH swings throughout the day. The higher the alkalinity in your pond, the more acid can be buffered on a daily basis, and the more stable the overall water pH will remain. In ponds with moderate to high alkalinity, water pH will often be neutral (7.0) to slightly basic, as both carbonates and bicarbonates are bases. Without a sufficient level of alkalinity, your pond would experience huge swings in pH within a 24 hour cycle, with higher pH in the day and lower pH in the night. These swings in pH are primarily caused by a combination of photosynthesis and respiration from filamentous algae, phytoplankton, and to a lesser extent, fish and bacteria. During the day, plants will carry out photosynthesis and absorb carbon dioxide from the water, which in turn, reduces the amount of carbonic acid and causes a rise in pH levels. During the night, plants will switch to respiration, consuming oxygen from the water and releasing carbon dioxide, causing a return of carbonic acid and a drop in pH levels. Carbonic acid (H2CO3) is a combination of carbon dioxide (Co2) and water (h20), and is the primary contributing factor to pH changes in fresh water ponds. 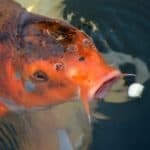 Calcium, as calcium carbonate, is one of the most important molecules for both water hardness and alkalinity in koi ponds. On top of its important pH stabilization role, organisms such as plants, bacteria, and fish all require a certain level of mineral carbonate to carry out essential biological processes. Beneficial bacteria living throughout your pond and filter will consume a large quantity of carbonates during the de-nitrification process while breaking down waste. Likewise, fresh water fish require a certain amount of calcium carbonate and magnesium carbonate for healthy bodily function, particularly for the regulation of salts within the blood; a process called osmoregulatoion. In ponds, calcium carbonate (CaCO3) can be considered the most important component of both general hardness and alkalinity. This is due to it’s high pH buffering ability and benefits to bacteria (carbonate-part), as well as its role in the regulation of fish health (calcium-part). How to Test Alkalinity & KH in Koi Ponds – What is the Ideal KH Level? You can test alkalinity/KH using one of many commercial pond water testing kits designed for general hardness and KH measurements. In many cases, you should not be surprised if you notice the test results for general hardness (GH) are similar, if not identical, to the KH and alkalinity results. This is because limestone (and dolomite) commonly make up the largest majority of water hardness, being comprised mainly of calcium carbonate [CaCO3] (2/3) and magnesium carbonates [MgCO3] (1/3). In these instances, the calcium and magnesium make up the “hardness” (GH) parameter, and the carbonate makes up the alkalinity (KH) parameter – but they’re still weighed as a single molecule, hence the similar results. Water test kits designed for reefs are useful as they provide measurements for both calcium hardness and KH/alkalinity. Measurements for alkalinity and general hardness results are often expressed as mg/L (ppm) calcium carbonate [CaCO3], which includes all calcium carbonates, magnesium carbonates, and trace alkali metals. If you live in a limestone heavy region, you can safely assume the majority of your water hardness is caused by calcium, as calcium carbonate [CaCO3]. As calcium carbonate is so important to both pH buffering (the “carbonate”) and fish health (the “calcium”), you can also choose to test your water for just free calcium ions with a specialised water testing kit, such as for salt water reef tanks. These tests can be useful for determining just how much calcium is contributing to general hardness, as you can still have hard water without any calcium carbonate. In regions where hardness is caused by minerals other than limestone and dolomite, the water may be almost devoid of calcium carbonate and magnesium carbonate – the two most important KH buffers for koi ponds. In koi ponds, an alkalinity (KH) range of 75 to 200 mg/L (ppm) CaCO3 is considered ideal, as water within these parameters will have good buffering capacity against pH fluctuations, and fish will have sufficient carbonate salts for healthy biological processes (1). Where hardness is caused by limestone, this alkalinity (KH) range equates to a general hardness (GH) of 75 to 200 mg/L (ppm) CaCO3. The table below shows approximate free calcium water concentrations converted to alkalinity (KH) parameters in mg/L (ppm) and degrees of hardness (dKH) with green being the optimal average range for freshwater fish, including koi carp. Is it safe to put a cuttlebone in an inside 55 gallon koi tank? Unless your water hardness was already incredibly high, I don’t think it would be a problem. Could I ask, though – is this a growout tank? Also, what is your main goal with adding cuttlebone? Just how high is your KH parameter exactly? If your KH is only a little too high, you could simply remove some water (5-10% ~) via a water change and re-fill the pond with softer water or distilled water. This would effectively remove a portion of the dissolved carbonates that make up the KH parameter, and the new water, which would be lacking in carbonates, would stop the KH from returning back to it’s previous point. However, unless your KH level is incredibly high, I’d say just leave things as they are and continue to monitor overall water quality. A slightly high KH reading isn’t dangerous to fish, and it will likely reduce by itself in future as the waters buffering capacity (carbonates) are used up through natural processes (rainfall, beneficial bacteria etc.). To raise both alkalinity and calcium hardness can I use the same stuff that’s made for pools? Or is that not safe for ponds? Could you let me know which product/s you’re referring to? I have been having a problem keeping my PH down in my 6000 gallon Koi poind. It is fairly new so we are in the throes of trying to get everything in balance. I am on well water. It is quite hard. GH 32 degrees, KH 20-22 degrees, when I measure the PH of the water directly out of the well it’s PH is 7.6. But after filling my pond my my water consistently shoots up to 8.4 to 8.5 ph with in a few days. I have been using Pool PH Reducer to bring the ph down. This is in the form of CONCENTRATED Granular Sodium Bisulfate. I have now brought the KH levels down to 6-7 degrees of hardness and my ph has dropped to ph 8.1. But that is still pretty high. GH has gone down slightly to 30 degrees. But that is not expected move with ph reducer and I don’t think I am supposed to worry too much about the GH number in general. But I don’t know how hard water high GH and drastically reduced KH might fight with each other or if it matters at all. I would like to bring the PH down to 7.5-8.0. Basically the primary question is how low can I take my KH and still feel I have a sufficient buffer to avoid dramatic PH swings. by the way daily PH readings seems pretty sticky I don’t seem to get a lot of swings from morning to evening which is good. If I do take KH to low it is pretty easy to bring it up with a series of water changes. As my source water is lousy with lots and lots of KH (20 degrees as I mentioned above). Follow-up question, should I be using a different product do reduce PH (muriatic acid?). Something I have not heard of. Do I need to consider putting in a softener to bring the GH down is is that even a factor. Also softener will then be trading GH for salts, which may not be good for the Koi either, I remember reading about that someplace. By the way is the product I have been using to reduce PH. Currently the fish seem a bit stressed at 8.16 ph (they were seriously stressed when any time it approached 8.5 lots and lots of flashing). Currently they like to hang at the bottom of the pond and they flash a bit more then I think they should. Well sometimes it seems like flashing and sometimes it just fells like they are ‘spooked’. But they certainly seem to be behaving a big more frantic then say 3 weeks ago. Previously they would come directly too you looking for food whenever you approached the pond. Now they tend to just hang out near the bottom and jump, often away from me, in a school when I am near the pond. These are 7 one year old Koi and 2 two year old koi. All quite small maybe 5 to 8 inches. All Japanese Koi if it matters. All the other numbers for ammonia, nitrate, and nitrate, and phosphate all test out at 0. Sorry there is a lot of information in here but water chemistry is *hard*. I and wanted to give you the most information I can to see if someone can help. Thank you for the comment. I’ll do my best to give you a hand here! Firstly, before I mention anything else, I want to emphasize that stability is probably the single most important factor when it comes to keeping koi comfortable and healthy. So long as pH/KH parameters are not reaching extremes, and also don’t fluctuate too much daily, keeping these parameters at a rock-solid level (even if they’re a little high/low) is MUCH better than a constantly changing the underlying water chemistry. I’ll also say that a pH between 7.6 and 8.5 is still perfectly fine for koi. Sure, the upper level is higher than what most would recommend in an ideal world, but I can assure you from personal experience, it’s much better to have a slightly higher pH value which remains constant than it is to have one that fluctuates daily. Ok, with that out of the way, let’s take a look at what I feel is the main problem here. In regards to the changes you’re seeing from a lower pH at source to a higher pH in the pond – this is actually fairly typical, especially when using well waters. My guess would be there is a large amount of dissolved CO2 in the well water, and it’s simply escaping (“de-gassing”) upon reaching the more aerated conditions of the pond. The issue here is that dissolved CO2 is acidic, but once it de-gasses the water will become more basic as the acid leaves the system, driving pH upwards as a result. My gut is telling me that it is this pH change after adding fresh well water that is causing your problems with fish stress. 1) Aerate the well (and pond – always helpful!) directly with an electric air compressor. The disturbance in the well will keep the water healthier, and will also displace a large amount of gases before they can be added to the pond. Direct aeration is probably the easiest and fastest way to remedy those pH discrepancies you’re seeing. 2) Pump water from the well but go for an atomized spray delivery method. This will be slower, and you’d need to invest in some equipment, but it would ensure gases escape into the atmosphere before reaching the pond water. 1) Test overall water quality (ammonia, nitrates, pH etc.) daily for 2-3 weeks without performing water changes while you get the well water in-check. This will help the natural ecosystem become established, and prevent the swings that are obviously causing koi to become stressed. Readings of 0 nitrogen compounds (ammonias/nitrates) may not actually be good, as this may indicate there is very little for beneficial bacteria to consume and process. Beneficial bacteria needs to establish, spread, and thrive – and to do this it needs time, carbonates/alakinity, and food substances. 2) Continue to feed as normal (ensure it’s a high quality food), maintain filtration/equipment, and just let the koi settle down. 3) After this period, assuming all parameters are holding strong (no big spikes/drops), perform a regular water change with the new well water and treat the pond for parasites; in particular flukes. Winter is coming and parasites are a very common cause for flashing, rubbing, and odd behaviour in general. You could do this first, but unless you’re certain of parasites, I’d let the koi settle down a bit first and sort the well water issue before adding even more chemicals that may cause swings in water quality. 4) Consider adding a dedicated aerator to the pond to provide more oxygenation, if you don’t have one already. I hope that helps! I’d be very interested to hear how things turn out after a few more weeks, and I’d be more than happy to provide further input if you have more questions or run into problems. My gut tells me the issue is the well water, and simply aerating it to some degree will make a big difference. Ps – Yes, comments are reviewed before they’re published. Sadly, I get way too much spam these days, so there is now a small delay while I slowly get through the weeks pending comments! I have a koi pond. It is quite small – 120 gallons. My pH is a bit low at 6.6. My KH is at the lower end of the range at 3’d, and I was thinking of adding more carbonate. But my GH is already high at about 12’d. Will adding more carbonate do any harm? Yes, I’d certainly advise bringing that KH (and in turn pH) up a little bit. Adding more calcium carbonate should do the trick, just be careful when dosing as your pond is quite small and you don’t want any rapid swings in water quality. Although KH and GH are often connected, they’re still very distinct parameters. For example, general hardness isn’t dangerous by itself, but as many of the mineral ions that make up GH also contribute to alkalinity ( rising KH/pH), it should still be monitored. However, as seen with your water quality parameters, you can have both high GH and low KH, which usually indicates a lack of the certain minerals – primarily calcium and magnesium carbonates. Since your pH is also fairly low, it’s safe to assume your water lacks ions with the capacity to contribute to the pH buffer, so adding carbonates to raise the kH (and pH) is a viable and safe solution. Basically, even if your GH is really high, so long as KH and pH are within safe ranges, further increasing hardness won’t be an issue, as it’s the latter two parameters that will cause the major issues with fish, not the water hardness by itself. Your general water quality parameters look fine. Do you have many plants? Adding more plants will help soak up any extra nitrates (NO3), and performing small weekly (10%~) water changes will help reduce all nitrogen compounds and replenish alkalinity and trace minerals. Optimal alkalinity (KH) for most types of pond would be between 130-200~ ppm; assuming the KH parameter is comprised primarily of calcium and magnesium carbonates. You can perform a free calcium test to determine this which will check specifically for calcium carbonate ion concentration in water.